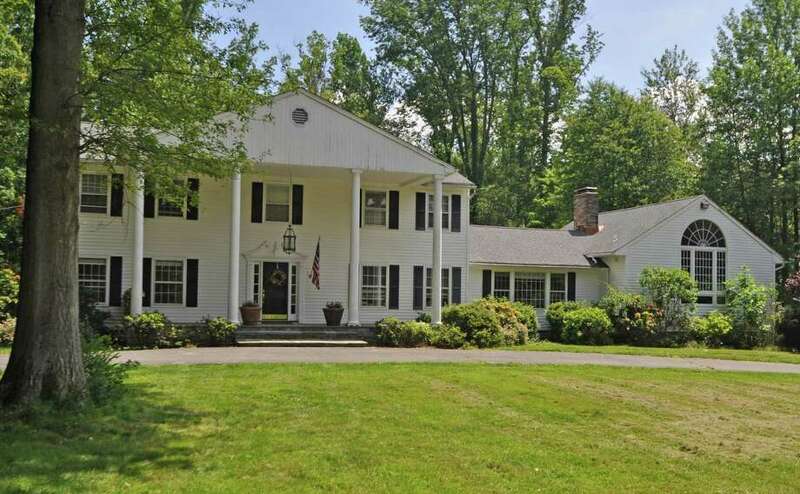 The house at 91 Labbance Lane is on the market for $1.05 million. Southern living is generally conducted at a more relaxed pace than that of the busy Northeast, but the stately Southern Colonial-style house with its four tall, white front columns at 91 Labbance Lane offers a chance for that slower domestic pace. Because it was built on a quiet cul-de-sac in 1981 in the Greenfield Hill section of town, safety has never been an issue. Children can play safely on the sparsely populated street, which has little vehicular traffic except from neighbors' cars. This house enjoys a 2.10-acre level property with a sprawling, manicured front lawn and a sizable wood deck in the sprawling backyard, as well as a long, covered front porch, all of which provide ideal places to recline and take in the slow movement of clouds as they pass overhead. Rock leisurely on the two-story porch, which has a bluestone "floor," and enjoy the view. "We feel embraced by the grounds and the beauty each season offers," one of the owners said. Although the house is located in a seemingly remote area of the town, the owners say they never feel far from downtown, shopping, restaurants and the beach. The Merritt Parkway is only 3.8 miles away. Interstate 95 is about the same distance away. The house is equidistant from the Southport and downtown Fairfield train stations; 4.5 miles from each. Greenfield Hill Center is just about 2 miles away. The Patterson Club is six-tenths of a mile from the house. There is a long, circular driveway to the white clapboard house, which has black shutters. There is ample parking to accommodate guests for the occasions when the owners entertain. The front entrance is flanked by sidelights and topped by decorative molding. Inside the home there is 4,270 square feet of living space that includes a spacious front-to-back living room, which opens to the large eat-in kitchen. The family room has a cathedral ceiling, a center fireplace with a slate tile surround and sliding doors to the rear deck, which goes almost the length of the house, and the backyard. The deck can also be accessed via sliders in the kitchen. The living room also has a fireplace. There is a center island and double porcelain sinks in the kitchen. Counter space abounds and there is a peninsula that separates the preparation portion of the kitchen from the eat-in area. The formal dining room features a large crystal chandelier. A large bonus room over the garage features a vaulted ceiling and a Palladium and picture windows. Because this room has a separate entrance and closet storage it allows for endless possibilities, one of which is to use it as an au pair or in-law suite. It could also be used as an office, billiard or game room, or a home theater. Upstairs, there are four good-size bedrooms. The large master bedroom suite features his and hers walk-in closets and an updated master bath with a claw-foot tub, shower stall, and double vanity. The three additional bedrooms share a hall bath. All three have great closet space. For more information or to set up an appointment to see the house, contact Kim Vartuli of the Valderblue Team, an affiliate of the Higgins Group, at 203-258-3797.